This book is deliberately focusing on vegetarian/vegan foods, not only to support these great lifestyle books, but also to encourage those people who eat flesh and dairy to try some great alternatives. Even though I have outlined in my other books very good reasons to avoid eating animal produce, I know some people will continue to do so, which is about choices. 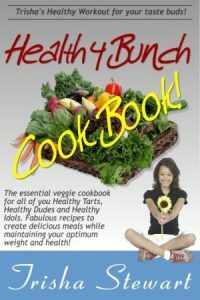 Choosing recipes in this book will be greatly contributing to your own health and wellness and that of your family and friends as well. You will be amazed how many people love to eat this kind of food. Help to spread the word about a great way of eating for optimum health and make this book part of your everyday eating regime. Phytochemicals and the foods you need to eat to get them. All images and the contents of this site are the property of Trisha Stewart – Author & Nutritionist and may not be copied or reproduced without the permission of Trisha Stewart – Author & Nutritionist. Any trade mark images used on Trisha Stewart – Author & Nutritionist belong to the respective companies and are displayed for visual assistance. DISCLAIMER: The information provided by Trisha Stewart – Author & Nutritionist is not a substitute for a face-to-face consultation with a medical practitioner, and should not be construed as individual medical advice. If a condition persists, please contact your medical practitioner. The testimonials on Trisha Stewart – Author & Nutritionist are individual cases and do not guarantee that you will get the same results. This site (Trisha Stewart – Author & Nutritionist) is provided for personal and informational purposes only. Trisha Stewart – Author & Nutritionist is not to be construed as any attempt to either prescribe or practice medicine. Neither is Trisha Stewart – Author & Nutritionist to be understood as putting forth any cure for any type of acute or chronic health problem. You should always consult with a competent, fully licensed medical professional when making any decision regarding your health. The owners of this site (Trisha Stewart – Author & Nutritionist) will use reasonable efforts to include up-to-date and accurate information, but make no representations, warranties, or assurances as to the accuracy, currency, or completeness of the information provided. Trisha Stewart – Author & Nutritionist shall not be liable for any damages or injury resulting from your access to, or inability to access, this site (Trisha Stewart – Author & Nutritionist), or from your reliance upon any information provided on this site.